Richard Ashford was a yeoman farmer in Maney in the 1640s. It was a mixed farm, with cattle and sheep as well as crops growing in the fields. Ashford had two horses to do the work of the farm, but he also kept a team of four oxen - for centuries the ox was the preferred draught animal, but by the seventeenth century the shire horse had almost completely replaced it. Growing in the fields were wheat, rye, barley, peas and oats, he also had three pigs and a beehive. We can learn this from the probate inventory of Ashford’s goods and chattels made on the 22nd May 1643 - this had to be presented at the bishop’s court before letters of administration were granted to the executors of his will. Each item in the inventory is costed, for example “Chairs and stools and cushions five shillings”. The inventory is arranged room by room, so we learn that he had, downstairs, a hall house, a little parlour, a buttery and, perhaps in a lean-to, a boulting house, upstairs there was an upper chamber and a little chamber. Most of the value lay in his farm, the animals together were worth £41, the crops £12, out of a total value for the whole inventory of just over £88. Most of the crops were still growing in the fields, being thirteen days work (approximately 13 acres); if half his land was pasture, the farm must have been about 30 acres. Ashford’s executors were his wife Anne and his son-in-law William Penn. Anne Ashford, who continued to run the farm, died in April 1649. Neighbours were called upon to value the goods and chattels of the farm once again; two of the four appraisers, Christopher Veysey and Nicholas Penn, had helped make Richard Ashford’s inventory The animals were once again valued at £41, and the crops, including “hard corn on the ground” (wheat and rye), hay, barley wheat and oats in store, and “corne to thresh in the barne” came to £7. The contents of the same rooms as in Ricahrd Ashford’s inventory are listed, with their contents, but there was now a new room with a new chamber over it; the total value is £68. The first bequest in the will, to son-in-law William Penn, was of her pride and joy, her team of oxen. There are many small legacies, three pounds to her grandson Richard Newberry “to put him forth to prentice”, two Newberry granddaughters, four Ashford grandchildren, two Penn grandchildren, and granddaughter Mary Cater are all remembered. Her four god-daughters received a shilling each and her daughter Mary Cater “my best petty coate”. William Penn and her son Simon Ashford were her executors, and her daughter Mary’s husband George Cater was one of the witnesses to the will. So whereabouts was this old house with its seventeenth century addition in Maney? The Old Smithy (now the Driffold Gallery) in Bodington Gardens seems likely. 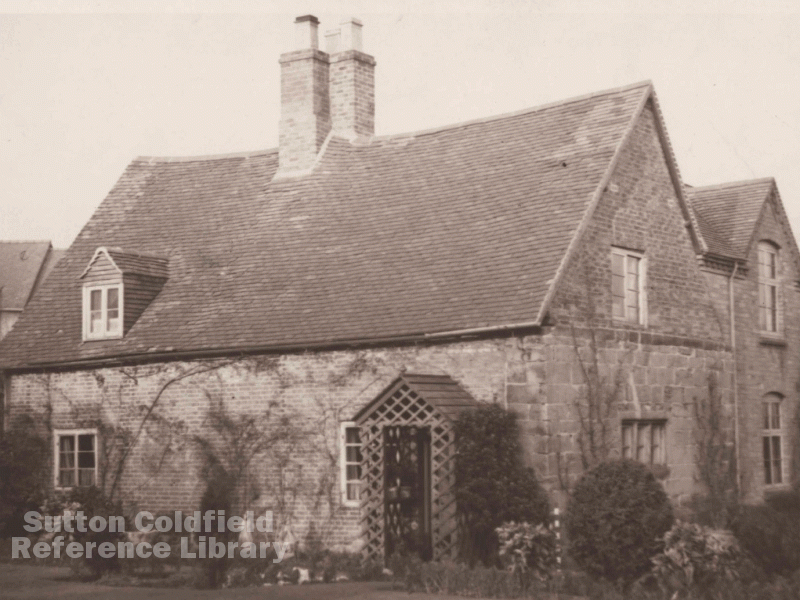 The Old Smithy was an Emmanuel College property, and College records show that it was occupied as a farmhouse by Francis Hearnshaw in 1824, farming 34 acres, similar to Richard Ashford’s 1640 farm, while the tenant of the Old Smithy in 1742, John Dawson Junior, farmed over forty acres.